High school drama, here we go again! In the corrupt Saebit High School where only the wealthy and gifted survive, there lives an unappreciated street dance club called Real King. The club is composed of students sitting at the bottom of the academic ranks, led by #196 Kang Yeon Doo. Her mortal enemy? The president of elitest club White Tiger, Kim Yeol. A scandal marks their first serious encounter with one another and their paths continue to intertwine when the two clubs are forced to form a cheer leading squad together. Will they be able to set aside their differences or will things make a turn for the worst? There was a lot of talk about this show for some reason (was it because of Eun Ji?) So I wanted to give it a fair shot. As always, I watched two full episodes before writing this review. I have to say, though I love Eun Ji as much as the next person, this show has failed to impress me so far. I mean it has a lot of what you expect from a high school themed drama, but it just doesn’t quite take it to the next level. In other words, I’ve seen it done before and I’m not excited. What I do like is the corruption story of the school which I believe is the big plot mover. After all, I do want to see White Tiger and Real King join forces to beat out the Principal and her annoying sidekick. Who doesn’t love a good ole “let’s break the cliques and unify ourselves against a common evil”? Although with only 12 episodes, I’m hesitant to expect too much revelation and plot development. 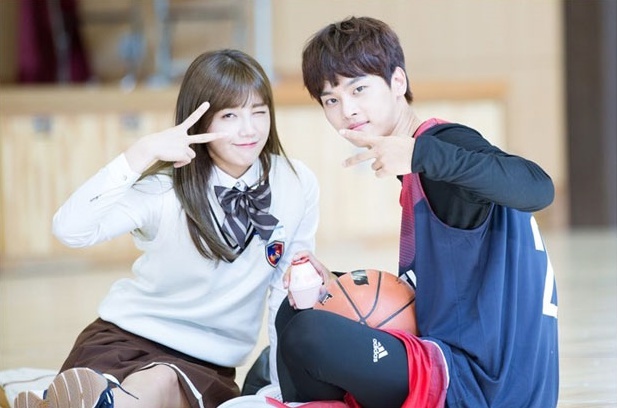 Jung Eun Ji and Lee Won Keun are both fine in their roles, but again, they don’t inspire and they don’t evoke any feelings out of me. I’m not gunning for Eun Ji’s character to win it all, nor am I fan girling over Won Keun’s (or lack of) charms. My heart was as still a rock during their first close encounter, which was not at all what I want out of a show. I mean, some fluttering would be nice because this is a romcom after all. Where’s romance? I don’t sense any chemistry. It also weirds me out that there are hints of coupling the OTP’s parents together. Are we dealing with some potential step-sibling problems here? Is this Love Rain all over again or what? Eep. Overall, this has been pretty average for me. I’ll probably keep watching it because it is short and I need something to fill my time. I don’t think my opinions will change drastically at the end, but we’ll see. Surprise me! Jung Eun Ji is part of girl group Apink. She made her mark in TV dramas as the lead in Reply 1997 for which she earnt the 49th Baeksang Arts Award for Best New TV Actress. She has since starred in That Winter, the Wind Blows and Trot Lovers. Lee Won Keun debuted in 2012 period drama Moon Embracing the Sun as young Kim Jae Won. He has since participated in Hyde, Jekyll, Me and Secret Door. This is his first role as the lead. Cha Hak Yeon, better known as N, is part of boy band VIXX. He was chosen after competing on Mnet’s survival reality show MyDOL. He was in Seo In Guk’s “Shake It Up” music video and debuted in 2013 with the album Jekyll. His first drama role is Noah in Hotel King. Ji Soo entered the entertainment world first as a stage actor. He broke out onto TV through his role as another troubled teen in Angry Mom. He was also in Love Frequency 37.2. I’m not impressed either, but I have a fun time watching Lee Won Keun act so much like a second male lead instead of the first lead that he is.